Home/ Mystic Festival in Poland. 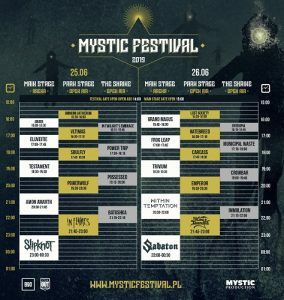 On June 25th and 26th, Poland’s MYSTIC FESTIVAL will celebrate its 8th edition and for two days, around 25.000 passionate metalheads will gather at the Tauron Arena in Cracow to enjoy a cold beer and the shows of their favourite artists. The top-notch line-up will feature a great amount of Nuclear Blast bands and the festival has now released the running order for both days and all the 3 stages.